Parade gear in the American West is often decorated with enormous quantities of silver. The basic style of tack is Western, with a clear Mexican influence. Silver is attached to every strap and surface possible, resulting in some really heavy gear. You can see a variety of traditional parade saddles at the Parade Saddle Archive. In fact, there is even one decorated with gold instead of silver - an expensive proposition, even if it is gold plate. 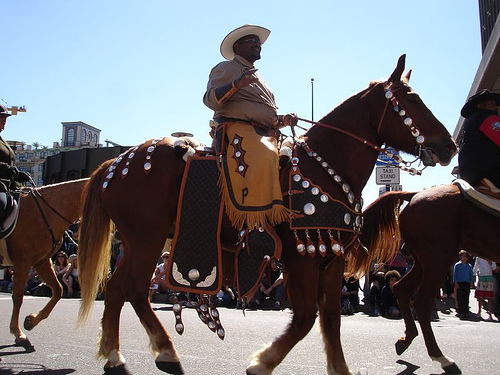 For those with more restrained taste, this California man has his horse decked out in parade gear with just a touch of silver.